Few areas of the world have been as profoundly shaped by war as the Middle East in the twentieth century. Despite the prominence of war-making in this region, there has been surprisingly little research investigating the effects of war as a social and political process in the Middle East. To fill this gap, War, Institutions, and Social Change in the Middle East brings together an international and interdisciplinary group of scholars who explore the role of war preparation and war-making on the formation and transformation of states and societies in the contemporary Middle East. Their findings pose significant challenges to widely accepted assumptions and present new theoretical starting points for the study of war and the state in the contemporary developing world. 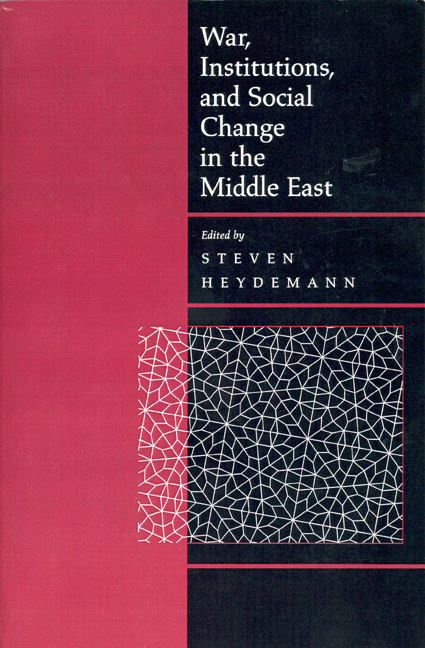 Heydemann's collaborators include political scientists, historians, anthropologists, and sociologists from the Middle East, Europe, and the United States. 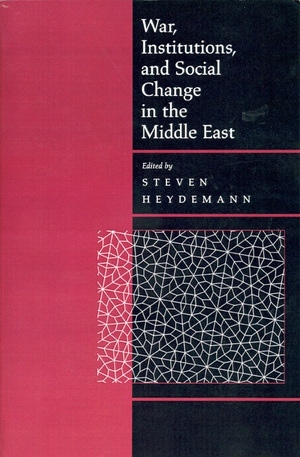 Their essays are both theoretically sophisticated and empirically rich, covering topics such as the effects of World War II on state-market relations in Syria and Egypt, the role of war in the rise of the Palestine Liberation Organization, the political economy of Lebanese militias, and the effects of the 1967 war on state and social institutions in Israel. The volume originated as a research planning project of the Joint Committee on the Near and Middle East of the Social Science Research Council. Steven Heydemann is Associate Professor of Political Science at Columbia University in New York City and the author of Authoritarianism in Syria: Institutions and Social Conflict, 1946-1970 (1999).